We define a culture of coaching as an environment where coaching is integral to the company’s DNA. Organizations with Cultures of Coaching are agile, have high retention rates and create a superior workforce crafted to meet the company's mission statements. Expose internal influencers to top-notch coaching and leadership development techniques and have them spread the word. This concept might seem counterintuitive to many Organizational Effectiveness or Learning and Development Professionals. These specialists tend to view People Strategy development as a linear process where competencies are flushed out via a card sorting or other prioritization technique, followed by a listing of organizational values, skills, knowledge and key behaviors needed by the organization to succeed, and eventually some sort of training program or developmental effort. While this traditional approach is elegant from a process perspective, in our experience the large, multinational consulting firms that promote this process miss an important point: Senior Leaders and top Line or Staff Managers want two things above all else: programs that work and rapid bottom line results. My personal experience as a turnaround specialist validates this point. In each turnaround role, I understood that I had a short grace period - about 6 months - to show tangible concrete results, despite the fact that many of the changes we were putting in place would take at least 18 months to have a full impact on the organization. Focusing only on the long-term would not provide clear successes to “buy the time” to be in the game when those improvements came to fruition. Frankly speaking, following my purchase of Performex, most of our early clients came from firms that were knee-deep in card sorting or another front-end phase of the People Strategy development. In many cases, the process had either stalled due to lack of support or the entire effort was deemed unsuccessful by the managers outside of the HR function. How do you build early tangible support for your strategic plan? The leadership skills or competencies that drive engagement, high performance, and innovation do not differ enough from firm to firm - or position to position - to justify waiting for the "perfect" strategy. Providing excellent coaching skills to a targeted portion of your staff is never a bad idea, especially if you select key individuals who will also spread the word that the new People Strategy is going to yield big results. Great Leadership among the technical managers group (IT, Engineering, Finance, R&D, Legal and Technical Sales) is in short supply in most organizations and needs immediate attention. Great leadership development, especially for technical managers, has several elements. First, the best programs appeal to these experts' strong suits: an affinity for science, problem-solving skills, intellectual acuity, and expertise following processes. The best development programs utilize a personalized approach to meet individual needs. Content is presented in immersion / boot camp style workshops followed by one-on-one coaching from seasoned executives. The workshops themselves matter. Best practices include simulations to enable on-the-job success, video feedback, case studies, team-based learning and support and process-oriented tools. Finally, incorporating scientific data such as NeuroScience, EQ, & Management Research validates the tools and helps facilitate their use. Getting a top-notch development program in place early accelerates cultural change and also shows tangible proof the strategy development process is yielding fruit to those who matter most - the critical talent within your organization. Are you starting to hear grumbling from the senior leaders about the slow pace of the development of your talent management strategy? 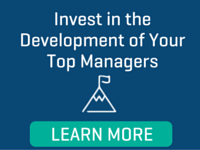 Are you searching for a top-notch leadership development program for your technical managers or critical talent? Do you need help accelerating your people process? Are you wondering why your people don’t love your developmental programs? Contact us to discuss ideas for optimizing your People Strategy.